The Colt shared much of its platform with the Smart forfour, though the Japanese Colt is somewhat conventional in comparison to its European relation. Introduced in 2004 the Mitsubishi Colt is one of those cars that are the product of an automotive alliance, on this occasion between Daimler - parent company of Smart - and Mitsubishi. The Colt shared much of its platform with the Smart forfour, though the Japanese Colt is somewhat conventional in comparison to its European relation. A supermini that offers decent interior space, if not particularly exciting looks inside and out, the Colt is a no-nonsense machine for those wanting assured reliability and relative anonymity. Mitsubishi offered the Colt in either three- or five-door hatchback guises or with a folding hardtop as the CZC convertible. That latter model aimed to steal sales from rivals like Peugeot's 206 CC, but it lacks the styling flair of its French competitor, the CZC an awkward looker roof up or down. The hatchbacks unsurprisingly make up the huge majority of used availability though, and while the three-door model is smarter in its looks, the five-door unquestionably makes more sense as a day-to-day proposition. Space in either is good for passengers, the tall, upright stance and relatively slim pillars giving a good view out. The boot isn’t vast in either, but it will swallow all but the biggest weekly shop. The Colt stayed largely the same through the majority of its long production cycle, though in 2008 Mitsubishi added a bold facelift. A new grille and headlamps brought the styling in line with Mitsubishi’s then design direction, the smallest model in the company’s line-up aping the looks of its most iconic - the Evo. For all its Evo-derived styling the Colt isn’t a particularly memorable driver’s car. It’s competent rather than exciting, though it rides decently and is relatively refined unless you push the engines hard. Engine choice is largely made up of the three-cylinder 1.1 and four-cylinder 1.3-litre petrol units, though a 1.5 DI-D turbodiesel is also available. Cleartec petrol models add stop-start for improved economy, while post-2008 cars also benefitted from a slightly improved interior. It's still not really up to the fit and finish of European rivals, if undoubtedly robust. Manual gearboxes came as standard, though an automatic was offered on the 1.3-litre petrol Colt. Mitsubishi also produced a hot version, called the Ralliart, with a 1.5-litre 150hp turbocharged engine; it was not officially imported into Ireland. If you’re after a city runabout the 1.1-litre Colt is more than adequate. Cleartec specification adds stop-start to allow the CO2 emissions to drop from 130- to 115g/km. 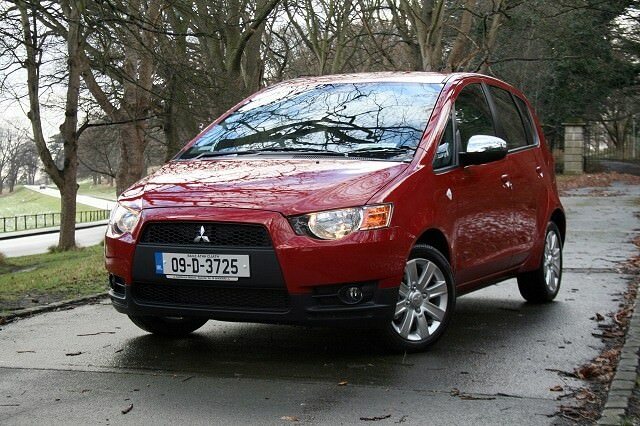 The Mitsubishi Colt is a worthy, if slightly dull contender in the supermini class. Neither particularly exciting to drive or look at, the Colt's virtues lie in its reliability, decent economy and usefully-sized passenger compartment. Sensible pricing and decent specifications across all also appeal, though there are more fun alternatives out there.